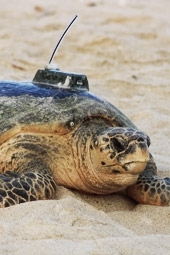 This project is based mainly on Masirah Island and focuses on loggerhead turtles. In 2013, an initial review of 2008-2012 loggerhead nesting data revealed the first indication of a dramatic decline in Loggerhead turtle nesting on Masirah Island, with a reduction in nesting females by approximately two thirds from the pre-1980 estimates. The recent estimated numbers of Loggerhead turtles nesting on Masirah Island are further confirming these alarming figures. Around 11’000 female turtles are estimated to have visited the island in 2014, compared to an estimation of 30’000 to 40’000 females in the late 70s. The major threats impacting both the habitat and population numbers are from land-use disturbances such as extensive coastal development, beach driving and light pollution, and sea-based disturbances such as fisheries by-catch and entanglement in ghost nets (discarded or abandoned fishing gear). An assessment of the Loggerhead sea turtle was completed in 2015 by the Marine Turtle Specialist Group of the IUCN Species Survival Commission (a global network of sea turtle experts), and the North West Indian Ocean Loggerhead subpopulation has been assigned as critically endangered, thus facing a very high risk of extinction in the wild in the immediate future. This subpopulation nests in Oman and Yemen and this assessment was attributed to the reported nesting decline on Masirah Island. In addition, the Masirah Loggerhead population suffered from the impacts of cyclonic storm waves and surge in 2015 with the Ashoba Cyclone, removing significant numbers of nests laid prior to cyclones and compromising available nesting habitat post cyclone. Continued monitoring will be able to prove whether the highest nesting density beaches on Masirah Island will continue to provide the highest levels of recruitment. The preliminary scientific findings on the significant drop of loggerhead populations on Masirah Island were presented to MECA and to the International Sea Turtle Symposium (ISTS) in Turkey in April 2015. In order to assist in research on Masirah Island, ESO has been training three full-time local field assistants (FAs) over the last 4 years. These FAs work on ESO turtle projects during the nesting season and assist in both the Renaissance Whale and Dolphin Project as well as ESO’s Egyptian vulture project during the off-season. 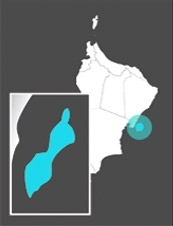 In order to ensure sustainability of this program, ESO has a permanent office in Masirah from which the FAs work.